Painted navy grey and known as MARLEENA-AE71 the O’Donnell family kept her penned at Blunt’s jetty in Williamstown for 25 years until 1995 operating as a private schnapper boat. When the schnapper started disappearing in the early-1990s with increased scallop boat fishing, the O’Donnels’ decided it was time to move to Cairns in Far North Queensland, barramundi territory. 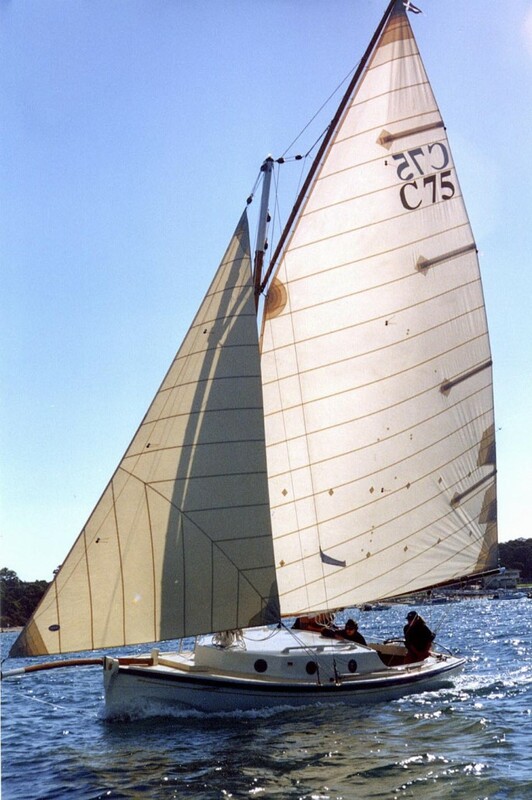 restoring the PORTSEA PEARL (a 16-foot carvel Lacco design owned by the Law family). She was renamed LADY VIRGINIA and refitted in 1996 by Len Dodson with a centreplate casing. She is Kauri-planked with a fitted sheet fibre-glassed deck (1980) and Spotted Gum frames. Her 4-cylinder diesel is relatively heavy by modern standards, and has 4 mounts, with 2 for the Borg Warner gearbox. An electric harness runs by loom to a mounted control panel. The engine operates comfortably at 2,000 rpm with a cruising hull speed of 7-8 knots. A hand bilge is mounted on the stern deck, and an electric pump in the rear bilge is wired to the battery.